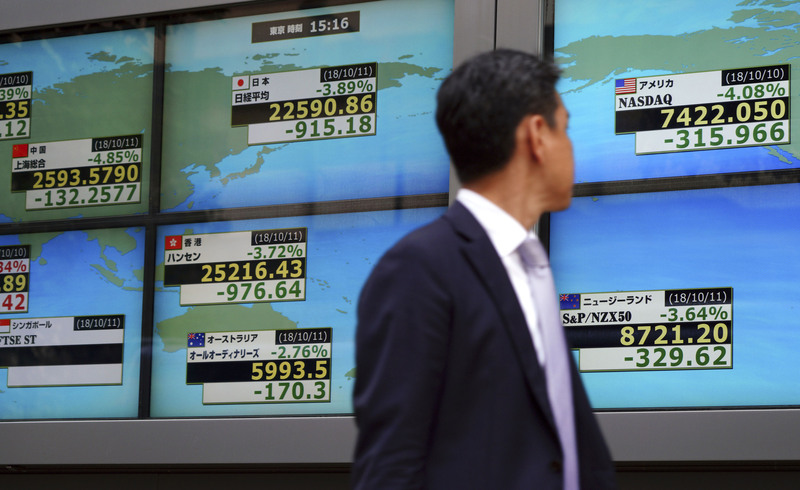 The Nikkei stock average plunged nearly 4 percent on Thursday, posting its biggest one-day loss since March. 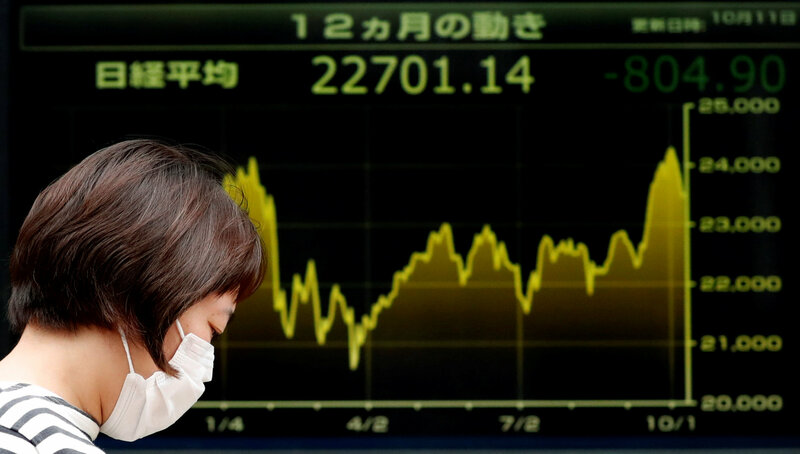 Stock markets in other parts of Asia also tumbled, after Wall Street’s worst losses in eight months led to broader risk aversion, a rise in market volatility gauges and concerns over overvalued stock markets in an environment of rapidly rising dollar yields. 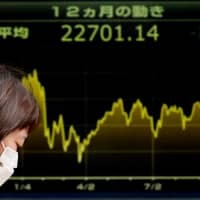 The Nikkei 225 stock average ended down 915.18 points, or 3.89 percent, from Wednesday at 22,590.86. The broader Topix index of all first-section issues on the Tokyo Stock Exchange finished 62.00 points, or 3.52 percent, lower at 1,701.86. Every industry category in the main section lost ground, led by oil and coal product, mining and machinery issues. 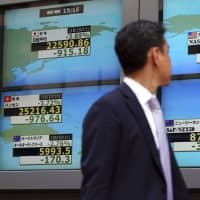 Tokyo stocks plunged from the outset of trading with investor sentiment dampened after the Dow Jones industrial average on Wednesday dived 831.83 points, or 3.15 percent, recording the third-biggest point decline in U.S. history. In volatile trading, the Nikkei average finished at a one-month low, posting its largest loss since March 23 and its third-biggest one-day point fall for the year. At one point it nose-dived over 1,000 points as Tokyo stocks extended losses in the afternoon in tandem with a sharp fall in other Asian shares, brokers said. “Investors could not buy Japanese stocks on dips today before seeing if the Dow’s plunge stops when the New York market opens later in the day,” said Mitsuo Shimizu, an equity strategist at Aizawa Securities Co. The yen’s advance against the U.S. dollar to the lower 112 level also put pressure on export-related issues, the brokers said. “Market participants also grew cautious about the possibility of a successive plunge such as (the one that) occurred on Wall Street in February, while institutional investors — like U.S. mutual funds — rushed to lock in recent gains and prompted the global sell-off,” Shimizu added. Rekindled concerns over trade tensions between the United States and China also dented market sentiment, after the Financial Times reported Wednesday that U.S. Treasury Secretary Steven Mnuchin warned China not to engage in devaluations of its currency. “Investors adjusted their positions by unloading risk assets including stocks, as U.S. President Donald Trump’s administration continues to escalate tensions with China in various fields including trade and currency,” said Hiroaki Kuramochi, chief market analyst at Saxo Bank Securities Ltd. However, both Shimizu and Kuramochi said they believe a steep fall in the global market is not likely to continue as U.S. economic conditions remain solid. On the first section, more than 97 percent of issues dropped, with declining issues outnumbering advancers 2,050 to 56, while four ended the day unchanged. Technology stocks met heavy selling following a sharp fall in their U.S. counterparts, with TDK falling ¥700, or 6.2 percent, to ¥10,540 and Fanuc dropping ¥1,395, or 6.8 percent, to ¥19,005. Cosmetic producers sank as investors were worried that the number of Chinese tourists to Japan could decrease on a possible slowdown in the world’s second-largest economy. Shiseido lost ¥521, or 6.6 percent to ¥7,317, while Kose plunged ¥1,340, or 6.7 percent, to ¥18,810. Bucking the downward trend, Don Quijote Holdings jumped ¥630, or 10.4 percent, to ¥6,680, as major retailer FamilyMart Uny Holdings said Thursday it will sell the entire stake in its supermarket unit Uny to the discount store operator. Trading volume on the main section rose to 1.952 billion shares from Wednesday’s 1.345 billion shares. Meanwhile, sinking global shares have raised the stakes for U.S. inflation figures, due later on Thursday, as a high outcome would only stoke speculation of more aggressive rate hikes from the Federal Reserve. “We’re all just watching the Fed. We’re all watching the U.S. economy; we’re worrying about an inflation spike or a wages spike that will come through,” said Rob Carnell, chief economist and head of research at ING in Singapore. On Wall Street, the S&P 500’s sharpest one-day fall since February wiped out around $850 billion of wealth as technology shares tumbled on fears of slowing demand. The S&P 500 ended Wednesday with a loss of 3.29 percent and the Nasdaq Composite 4.08 percent, while the Dow shed 2.2 percent. The blood-letting was bad enough to attract the attention of U.S. President Donald Trump, who pointed an accusing finger at the Fed for raising interest rates. It was hawkish commentary from Fed policymakers that triggered a sudden sell off in Treasuries last week, and sent long-term yields to their highest in seven years. “The rise in Treasury yields has been the primary catalyst for the sell-off in equities, since higher yields suggest a lower present value of future dividend streams, assuming an unchanged economic outlook,” said Steven Friedman, senior economist at BNP Paribas Asset Management.